Ald. Ameya Pawar announced his support for a zoning change to allow transit-oriented development on Montrose. NORTH CENTER — The controversial Montrose Green development is inching closer to becoming reality with Ald. Ameya Pawar (47th) announcing that he backs the zoning change requested by the property's owner. "After months of consideration, including multiple meetings with the developer and neighborhood building owners, I have decided to support the application for the zoning to be changed," Pawar wrote in an email to residents. 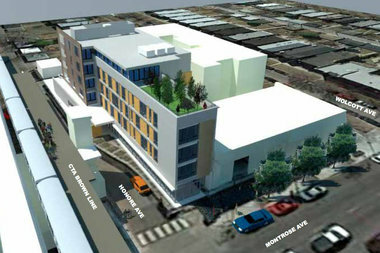 Under the property's current B3-2 zoning designation, developer David Brown, who has owned the lot at 1819 W. Montrose Ave. since 2009, would be limited to building a maximum of 13 residential units at 47 feet tall, with 10 required parking spaces, including those set aside for commercial activity. The requested zoning change to B3-3 would officially characterize the mixed-use project as a transit-oriented development — a citywide designation created in 2013 — also allowing for 10 parking spaces, but increasing the number of rental units to 24 and the height to 55 feet. The majority of the 24 units would be one-bedroom apartments averaging 750 square feet, with an expected total occupancy of fewer than 30 people, according to Brown. The intent is to attract young urban professionals as renters, many of whom are opting not to own cars, and to serve as an incubator for small business owners and entrepreneurs, Brown previously told DNAinfo Chicago. "There is a need for smaller units in the neighborhood and there is less likelihood that residents in small units will own cars," Pawar said in his email. "This development will be a benefit to the commercial corridor along Montrose and will continue to provide different kinds of housing options for residents in the 47th Ward." In weighing his decision, Pawar said he also took community feedback into account. Of 38 emails received from residents, 26 were for the development, 11 were against and one was neutral, he said. "Allowing the Montrose Green project to have 10 parking spaces instead of the standard 24 would be one [of] the dumbest things I have ever heard." "The plans appear to be made to maximize income with a large, dense building for the site and not enough thought about its impact." "Can you imagine all the traffic going down Wolcott then to Berteau based on the entrance to the retail? Taxi cabs, people circling for parking, etc. It would be an absolute mess." "We have a wonderful, safe, flourishing neighborhood and I do not see any need for new apartment/retail/restaurant space. ... I like this neighborhood because it is not yet overcrowded, and I like that there are still families settled here." "Providing dwellings that encourage public transit use by making it easy for individuals to get around should be a priority for our community and city." "The area immediately surrounding the Montrose "L" station could use a clean, well-maintained retail/restaurant space to counter the eyesores of Subway fast food and the check cashing store." "It will also make Montrose more vibrant and safe with 'more eyes on the street.'" All comments have been posted to the 47th Ward website. Pawar also cited support for the development from the Northcenter Neighborhood Association, Northcenter Chamber of Commerce and the Ravenswood Community Council as factors in his decision. Plans for Montrose Green were presented at a community meeting in December. In addition to apartments, the development would also include 5,300 square feet of first-floor retail/restaurant space and 3,000 square feet for offices on the top floor. Opponents of the project took issue with its density, height, lack of parking spaces and the likelihood of increased traffic, including tractor-trailers, on side streets. To address some of these concerns, Pawar said he would pass an ordinance restricting vehicles over five tons from driving on the 4300 block of North Wolcott Avenue. Brown purchased the property, which sits immediately west of the Montrose Brown Line station, during a Chicago Transit Authority auction. The site had been used to stage equipment during the Brown Line renovation. While his plans for the lot continued to take shape, Brown leased the land to Peterson Garden Project, which operated a community garden, also called Montrose Green, on the site. The development is scheduled to come before City Council's Committee on Zoning, Landmarks & Building Standards on April 23. The meeting, which is open to the public, will be held at 10 a.m. in council chambers, 121 N. LaSalle St., second floor.